Commissioned by the City of Paris, this installation was created for the Nuit Blanche 2006 : named “Co-Naissance” it was staged in the heart of French National Library (BNF). « The verticality of the BNF’s architecture creates a bare emptiness that aspires one towards the sky. Being clear-sighted on the world that surrounds us. Being free. In order to symbolise this elevation I imagined a “Jacob’s Ladder” that would climb towards the sky, suspended over the forest that grows in the centre of the BNF. Joining the earth with the Sky, the angels use Jacob’s Ladder to move up and down. 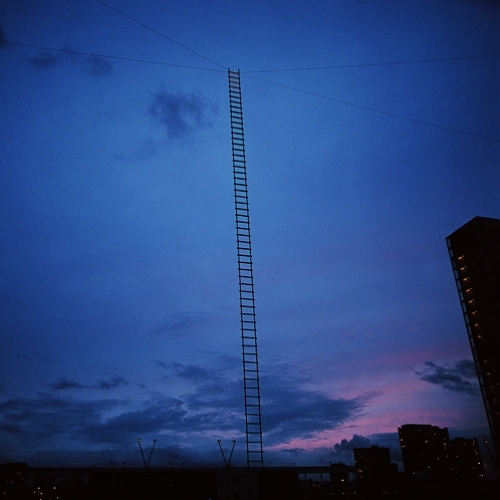 Enlightened by two beams of light symbolising the pace of the angels, the ladder drew an infinite vertical line. Walking towards the forest and the ladder suspended between the earth and Wisdom, one started hearing music rising from the ground. Composed by rock band Placebo it changed into an airy improvisation by composer Henri Scars Struck as one reached the forest. Echoing out of nowhere, a voice repeated texts written by Guy Debord. A journey out of time.